Sales of BBC programmes to foreign broadcasters helped operating profit at its commercial arm, BBC Worldwide, rise 17% to a record £117.7m. Demand for DVDs of shows such as Planet Earth and Doctor Who also pushed total sales up by 13.1% to £916m in 2007/8. Earlier in July, it said it would close Audiocall, which failed to pay £106,000 from premium-rate phone-ins to charity. And when it bought travel book group Lonely Planet it was criticised for extending its commercial involvement. Following the Lonely Planet deal in 2007, BBC Worldwide attracted further opposition from critics earlier this year when it introduced advertising to the BBC website for those accessing it outside of the UK. BBC Worldwide said it had sold formats of several shows abroad - including Dancing With The Stars to India and Top Gear to Australia. 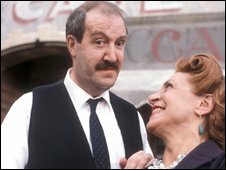 All 83 episodes of classic comedy 'Allo 'Allo were sold to a German television channel while the Life on Mars concept was sold to Spain - with the setting altered to the post-Franco era of 1978. Other notable successes included Ganges and Earth - The Biography and the first ever Chinese co-production, Wild China. "BBC Worldwide has achieved another year of double-digit profit growth, while also making significant strategic investments in new businesses to prepare the company for the digital media world," said chief executive John Smith. "The continued international appeal of our content and formats, coupled with high demand for home entertainment and the strengthening in key markets of our channels and production operations, has enabled the company to report very good results." In its annual report, the BBC said that BBC Worldwide profits could be at risk in the event of a wider economic downturn. However, it added "it is relatively well protected due to the diverse range of businesses and global markets in which it operates". "Whilst a decline in the advertising market would impact on sales, other revenue streams would provide protection," it said. The errors at Audiocall - which has handled the BBC's phone-ins for 17 years - were found during an audit for the BBC Trust earlier this year. BBC Worldwide said the mistakes had been "regrettable". It added that the decision to put adverts on BBC.com had been made after consultation with the Trust. Critics argued it could compromise editorial integrity. The BBC argued that overseas readers, who do not pay the licence fee, should contribute towards the costs. In February, BBC Worldwide confirmed that it was in talks with private equity groups to raise funds for possible acquisitions.